Tonight sommbaby and I had a date. We veered through the drenching rain, made our way midtown, fighting probable uninsured Texas motorists, to pull into the Pearl Brewery and plop into The Sandbar Fish House & Market. For those who haven’t read, heard, or who may have been out of touch with the gastronomic world, The Sandbar has consistently been recognized as San Antonio’s top restaurant as voted by critics and diners, and is the brainchild of Andrew Weissman, the culinary whiz kid of San Antonio’s former Le Reve. There have been many instances when the sommelier and I have eaten here, even when I have brought my friends, my parents, and have recommended the experience to those I love; it all revolves around one concept: the beauty of the dish. Over the past many years, even before The Sandbar relocated to the Pearl, there has been one consistent component to the restaurants success: Executive Chef Chris Carlson. One only has to hear of his specials to recognize the brilliance; I almost don’t even bother to look at the menu. Having survived Charlie Trotters in Chicago, Le Reve, the original Sandbar, he is now second-hand to Andrew Weissman, and has taken the culinary scene in San Antonio to a new level. Each plate is perfected with his artistic vision. 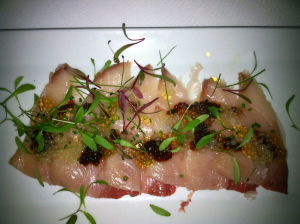 We started with a Hamachi sashimi with chef prepared soy, mirin, and yuzu infused caviar. Micro greens to garnish. The process to make your own caviar is daunting, but a recent trend among culinary artists. I won’t hesitate to say that the yuzu caviar was my favorite, the round pearls smooth on my tongue, leaving a salty, luscious essence. The thing is, if it was only the food, it would be one thing. But, Adam Spencer, sommelier, can also pair your meal with the most drinkable wines of the moment. He started us off with a Domaine Chandon Etoile, a beautiful Rose sparkling, with a sunset color and a rich, semi-sweet finish. With a mixture of both Pinot Noir and Chardonnay, the glass was able to match all of our dishes, but paired especially well with the Hamachi. 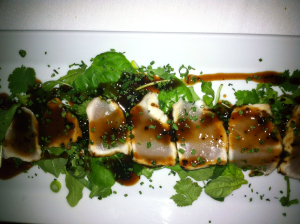 Our next course, swordfish tataki with a black bean Asian sauce, was mild in flavor. When married with the herb salad, however, the fresh greens provided a tang that lingered on the palate. A beautiful combination, the dish paired well with the Nigl Gruner Veltliner, a very crisp and slightly fruit forward white wine. With fresh fish, crustacean, and oysters flown in daily, Chef Chris Carlson has a plethora of ingredients in which to choose. The close proximity to the Pearl Farmer’s Market doesn’t hurt either. For our last course, sommbaby and I sipped on a creamy bouillabaisse broth, and enjoyed mussels, clams, fish, vegetables, and fish laid atop polenta. Served alongside garlic toast, the bowl of goodness did not last long. Sommbaby especially enjoyed the flaky fish and buttery flavors. 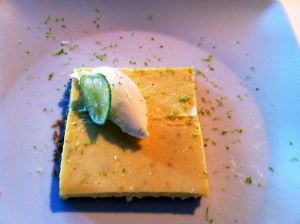 One entity that has consistently appeared on The Sandbar’s menu has been the key lime pie. Fresh. Creamy. Delicious. Perfect. It’s a mainstay, and well worth the extra calories. 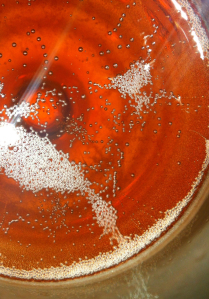 Weissman had it right when he opened The Sandbar. 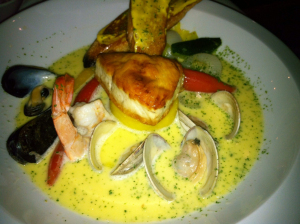 There is no other restaurant in town with such high quality seafood. He also had it right when he snagged Chef Carlson. There is no other Executive Chef in San Antonio who has performed with such consistency and endurance. 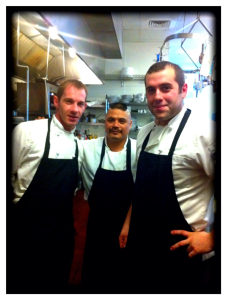 Both Chefs have set the bar really high, and I look forward to continuing to enjoying every morsel yet to come.